The Apple iPhone X is the latest introduction in a long line of successful generations of the company’s flagship product line. It’s one of the top phones out there with features that exceed practically anything else out there. Naturally, that will change in less than a year from now. But for today, it’s one of the best out there. In addition to being one of the most expensive phones, it’s also Apple’s largest one to date. The screen size checks in at a hefty 5.8 inches diagonally. Surprisingly though, the overall dimensions of the Apple iPhone X are quite reasonable. That’s because they took a play out of the Samsung playbook and decreased the outer bezel (although in the case of the Samsung Galaxy S7 Edge, Samsung removed it entirely). The display comes very close to the edge. While making the phone smaller, it also can add complexity to daily use as your typical grip from the sides could accidentally activate screen functions. The way around it is to buy a good thick case. In addition to the protection, it adds to the usability of the phone, especially in this case. We like Otterbox a lot and we have an article to help select the right Otterbox Case. The cases are a bit more expensive than some others but in our opinion well worth it. Consider the Otterbox Defender for Apple iPhone X. It’s their top of the line case and offers considerable protection. So let’s look at the critical measurements for selecting a mount for the Apple iPhone X. We have been recommending expandable universal cradles for phones lately so we’ll need to know the length and width. The Apple iPhone X measures 5.65 x 2.79 x .30 inches. That’s actually smaller than the Apple iPhone 7 Plus yet offers an additional .3 inches of diagonal screen space. It’s also worth noting the Apple iPhone X is weatherproof. It’s rated as IP67 which means it’s protected against the effect of water up to one meter deep. Note the term weatherproof. It’s not a submarine but can handle inclement weather. Like so many other generations of iPhone before it, a very likely use for an Apple iPhone X in the car is going to be as a GPS. such as Waze. You may also be using it for music streaming using a service such as Pandora or Spotify. Regardless of use, you’re going to need a solid mount for this phone. So let’s move on to our mount discussion. The most popular location for mounting a phone continues to be the windshield. We continue to like the Arkon Windshield and Dash Mount for most smartphones. The included cradle opens at a press of the side button to 3.4 inches. It’s large enough for the iPhone X. A vacuum base is included that attaches by pressing the lever. Your phone can swivel 360 degrees and pivot towards the driver. An included adhesive dash disk will facilitate mounting to your dashboard if preferred. This is great for drivers in states that do not permit windshield mounting. Vent mounts continue to be popular places to mount a phone. Consider the mount in the photo that accompanies this article. 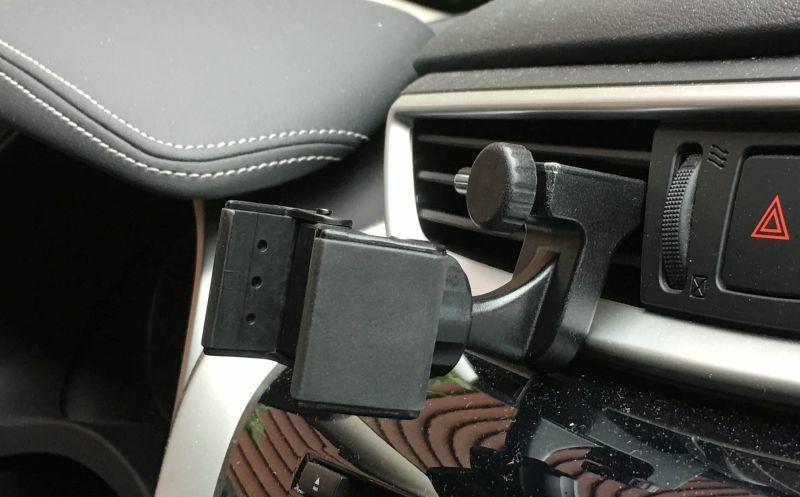 That is the Square Jellyfish Jelly-Grip Car Air Vent Mount. The Square Jellyfish Jelly-Grip includes an expandable cradle that grip the Apple iPhone X from the sides. It has a ball and socket so the cradle swivels into any orientation. This mount will work on flat vent slats that are 3/8 to 1 inch deep. The included cradle opens to 3 5/8 inches so it will fit without a problem. We reviewed the Square Jellyfish mount in detail in 2016. This vent mount places the Apple iPhone X near eye level. It’s not as visible as a windshield mount so it stays out of the view of potential thieves. We recommend attaching to the center air vent. For cars that have a CD player, why not put it to some use? The Mpow CD Slot Mount for SmartPhones uses a knob on the bottom to secure the mount within the CD player. I prefer this mount to others in this category as it will permit a more custom and secure fitting. You don’t want the mount to rattle around inside the player. The mount features a universal cradle that will fit your iPhone X with or without a case. For motorcycle use, we continue to recommend the RAM X-Grip series of cradles coupled with one of their metal mounts. The RAM X-Grip cradles have been a favorite for a long time and you can read our overview of this series. Consider the RAM X-Grip IV Motorcycle Mount. These are heavy-duty mounts that are mostly constructed of metal. The mount has gone through some rigorous shake tests and holds up well on a motorcycle. The cradle opens to hold an Apple iPhone X with or without a case or skin.